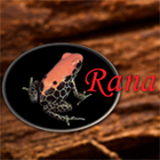 Ruud Schouten is the owner of ‘Rana’, a Dutch company he started in 1994, and which specialises in breeding and providing frogs from South and Central America for people who love to keep and breed these animals. Ruud’s ethics are reflected in the way he runs his business, with the utmost care taken with all his animals during collection and transportation, and he personally ensures that all specimens are completely ethically sourced. The animals he has are maintained in optimum conditions and are always of best quality. Ruud has specialised in neotropical frogs since 1979 and is also highly committed to supporting their conservation. Project Lemur Frog is very grateful to him for the support he is providing with regards donating much needed funds for the project, thus helping conserve these endangered frogs in a variety of ways, both In-situ and ex-situ, including research, fieldwork, and protection of natural habitats.